A teenage driver has had a lucky escape after his car left the road and crashed through a fence near Basingstoke in Hampshire. 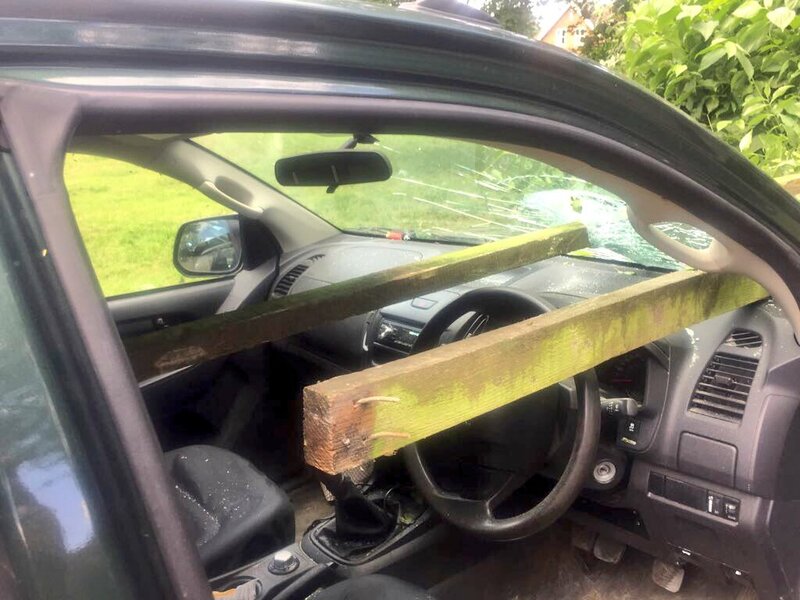 Two wooden posts went straight though his windscreen on the driver's side. Luckily he escaped major injury, the posts missed his head - instead passing either side of him - pinning him in his seat. It happened off the B3046 at Preston Candover. Paramedics from the South Central Ambulance Service were called to the scene. The teenager was taken to the Royal Hampshire County Hospital in Winchester. The South Central Ambulance Service NHS Foundation Trust (SCAS) has sent out a message wishing everyone a happy, healthy and safe Christmas and New Year. The organisation says that staff will be busy over the holiday period and are working hard to get to patients with the most life threatening conditions as a priority - such as those experiencing chest pain, severe blood loss, choking and black outs. Complaints against South Central Ambulance are up 57% on last year. The ambulance service, one of the biggest in the region, received 599 written complaints. People are most angry about how long it takes before an emergency vehicle arrives. The service put some of the blame on an increase in the number of callouts, and said every complaint was 'fully investigated'. It's one of the biggest killers in the UK. Every year, seventy-six thousand people die following a heart attack. But many of these deaths could be avoided if the public was more aware of the life-saving equipment that's in our village halls, gyms and work-places. That's the view of South Central Ambulance Service who're raising awareness of difibrillators in a new campaign. They want more of us to know how to use them and feel confident in doing so. Juliette Fletcher reports from Wantage on the life-saving technology that we can all use. Hoax 999 callers are 'risking lives'! People who make hoax 999 calls are risking lives. That's according to the emergency services in Hampshire who recently received more than fifty prank 999 calls in one day. In one case a twelve-year-old girl diverted crews to a fake heart attack patient. Nia Mason reports. Hampshire Fire & Rescue and South Central Ambulance Services say it can take up to three-days to trace next of kin. A message in a bottle can be a life saver to those that live alone or suffer from a disability or long-term health condition. The message should be an A4 form that asks for basic personal and medication details. The form is then placed inside a small plastic bottle which is then kept in the fridge. A sticker is placed on the outside of the fridge to alert anyone that visit the property that information is in the fridge. "This is a simple, free idea that can help so many people, that’s why along with South Central Ambulance Service Hampshire Fire and Rescue Service is backing the scheme 100 per cent."